Roberta is one of our members who recently tried personal training to see if it could help get her started on the road to fitness. Here is her story in her own words. Thank you Roberta for sharing! My story is simple I wanted to make a lifestyle change. My doctor told me I was worn out……I had developed some health problems and it scared me. I will be 60 in December, 2013, and I was slowing down. I decided I did not want to be an old 60-year-old person! I had been saving for a new computer and decided to take that money and invest in myself! I had been looking for someone to work with me using a more natural philosophy and approach to health. Through a friend I found out the Spa I used to go to had reopened under the name Shirlee’s. I checked it out online and read Konnie’s bio… Her background was just what I was looking for. I signed up with Konnie for 20 personal training sessions and in 2 months it has made a huge difference. I not only have lost weight and lost inches, but my health is better and my outlook on life is better. I look forward each week to my training session, and it keeps me anchored in my goal! My personal trainer’s knowledge has made all the difference. She has helped me understand the importance of overall health and how to pay attention to what I am eating. I eat better, and I am losing weight and inches. In mind—how to focus on myself to achieve an overall positive state of being again. In body—by looking better I feel better about myself. In spirit—through calmness I can focus on being an individual in my crazy, fast-paced life. It is not just about losing the weight, but also about making changes in how I live life everyday. I am happy to say I recently saw my doctor and my health problems are fading away by the changes I have made in my new lifestyle. Thank you, Roberta, for sharing your success and inspiring others. 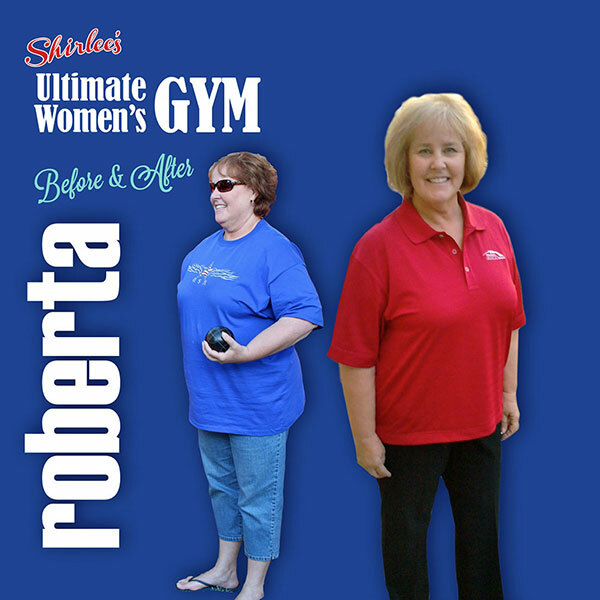 This entry was posted in Before and After, General and tagged before and after, grand opening shirlees, shirlee's fitness club for women. Bookmark the permalink.